The Translate app for Slack makes it super easy to instantly translate text from within Slack. Automatically translate all of your messages in a specific channel or direct message - a huge time saver for multi-language teams. Version 2 now supports over 100 languages and includes interactive buttons and settings that enhance the /translate method, making it easier to get the translations you need. 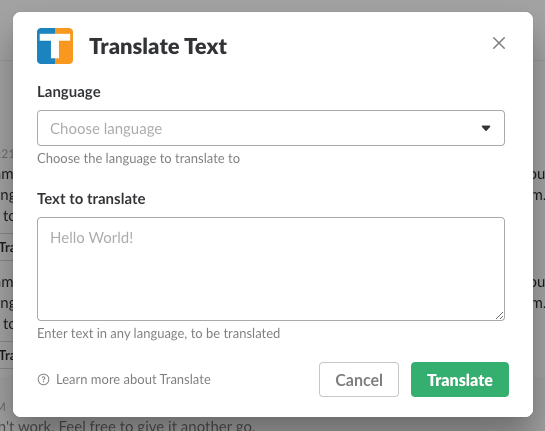 Or install directly from the Translate page in the Slack App Directory. The source text doesn't have to be English, the app will attempt to auto-detect the source language. This means, for example, that you can use it to translate things into English, if desired. The /translate command and the translation will only be visible to you -- it will not be seen by other team members in the channel .... BUT, with version 2, you will also see a [Post This] button that you can use to optionally post the translation to the current channel or direct message. There is a 1000 character limit per command. Use /translate by itself, without specifying language or text. Automatic translation is a powerful feature that can save you tons of time if you frequently interact with team members who speak a different language. You can setup any channel (or DM) to automatically translate every message you send to that channel. You don't need to enter a command, fill in a form, click a button, or copy-and-paste. Just send your message in your own language, and within a few seconds, it will be translated automatically for all channel members to see. The @translate bot performs the automatic translation for you. 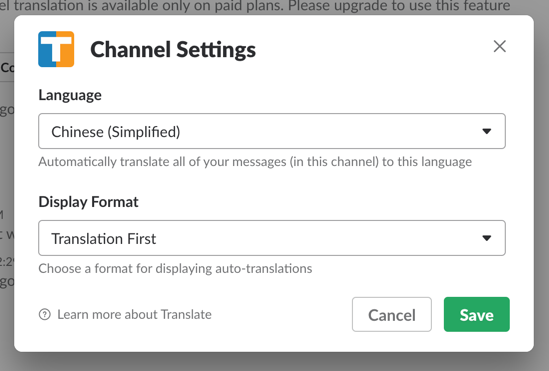 To setup automatic translation on a channel, you first need to invite @translate to the channel. The easiest way to do this is to simply mention @translate in a message -- then Slack will inform you the bot is not a member of the channel, and give you a link to invite. Once a member of the channel, mentioning @translate will bring up a menu of buttons. Choose the [Settings] button to setup or edit the automatic translation settings for that channel. Choose the language you want to translate into, and the Display Format. The latter affects how the translation appears in the channel for all members to see. Replace will completely replace the message in your language with the translated version. Source First will show the message in your language first, with the translation appearing below. Translation First will show the translated message first, with the original source text below. While the Replace option is the cleanest, the other options may help provide context for you as you review past conversations (since they include the original text in your language). You can change these settings at any time. Repeat for each channel as desired. You can also setup automatic translation on a Direct Message (DM), but the @translate bot needs to be part of the DM. To do this, create a new DM that includes both @translate and the person you want to DM with. Now this new DM includes @translate, so the bot can perform auto-translations. Within the new DM, mention @translate to get the menu buttons, choose [Settings], etc., as described above. Starting with version 2, there are both free and paid plans available for Slack teams. If you have been using version 1.0, you will continue to get all of the same features and functionality on the Free plan for version 2 (plus some additional features too). The Pro plan enables you to share translations directly to the channel and to setup automatic translation on an unlimited number of channels ... for only $19 per month per team. The Plus plan costs $49 per month per team and is designed for teams that do high volumes of translations. Free Trial: All of the features are available for free for 30 days, enabling you to try them and assess their value to your team. The Translate app does not store any messages translated, in any language. The app receives the contents for the translation and it sends back the translation. During installation and with each translation, the app receives basic information about your team and channel, and that information is stored in order to save your settings, remember your current plan, and monthly character count. If you are looking for a language not listed above, let me know -- it might just be easy enough to add. The /translate command and the translation will only be visible to you -- it will not be seen by other team members in the channel. The Translate app does not store any information about your Slack team or channel. The app receives the contents for the /translate command and it sends back the translation. During installation and with each /translate command, the app does receive the name or your team and channel, but that information is not stored in any way, as it isn't needed to provide the translation. This plugin fixes an issue introduced with Google Chrome v17 that causes admin entry previews to display a blank screen. This seems to happen only when the entry contains img tags with fully qualified src URLs from the same domain as the MT install. For some reason, Chrome now suspects this to be an XSS attack and will not render the iframe with he entry preview. This plugin adds a response header that tells Chrome to skip its XSS checking for this request. It only adds this for admin Entry Previews. The Facebook Tools plugin for Movable Type enables you to easily and automatically share your MT entries on Facebook. The plugin pushes updates directly to Facebook immediately when entries are published, avoiding the delays of other services. Future versions of the plugin will add additional Facebook integration features. There are a number of free services out there that will automatically share your entries to Facebook. In most cases, these services work by periodically checking your blog's RSS feed for new entries to post. While this works, it means a time lag or delay before new items get posted to Facebook. The delays get worse and more frequent when these services become popular. TwitterFeed has over 1,000,000 users and NetworkedBlogs has over 300,000 -- because they have so many RSS feeds to check, it can often be a long time before they get around to yours. The Facebook Tools plugin solves this delay problem by pushing the Facebook updates directly from MT, immediately, when the entry is published. The plugin is pretty simple. First you register your Facebook Application (easy to do, takes less than a minute) and then authorize MT to post updates when new entries are published. After that, every new entry gets pushed to Facebook quickly and directly and automatically. The updates include an image from your entries (if present). Post to both blog and author profiles at the same time. This is great for multi-author blogs, or if you want to post to both your person profile and to your blog's Facebook Page. Optional customized status message for each entry (the default is the Entry title). Option to use a different Facebook App for each blog in your system. If your system doesn't not already have one of these, note that the latter is known to be easier to install. Create a Facebook Application. This is easier than it sounds, and it only few settings are needed here. Choose a name for your App, which can be the same name as your blog. The upload a Logo and an icon image -- of these the icon is more important. (if you want you can use my Logo image and my icon image.) Then click on the "Website" tab on the left, and fill the "Site URL" field with the domain of your admin MT login eg. http://www.mydomain.com. Then save the settings, you can leave the rest of the settings the way they are. Copy the "Application ID" and "Application Secret" in the settings for the plugin, then save the settings. Return to the blog-level plugin settings and click the Facebook Connect button to authorize your blog to post to Facebook. The Facebook authorization dialog will ask for the necessary permissions, click "Allow". After authorization, if using the Pro version of the plugin, you will be given an option to choose one of your administered Facebook Pages to post updates to. Return to the settings once again and click the "Auto-Share" setting to enable auto-posting to Facebook, and adjust other settings as desired. (Optional for Pro) Authors can also connect their MT author profile with a Facebook account by choosing the "Facebook Account" item from the left menu of their user profile. Note that entries will be posted to Facebook only if "auto-share" is enabled in blog settings for the plugin. Future versions of Facebook Tools may include other integration features such as integration with Facebook Likes, Comments, and more. Suggestions are welcome. For legacy reasons, Movable Type and Melody publish future or "scheduled posts" by way of a periodic task. In short, these means that periodically MT will checked to see if there are any entries with a Scheduled status that have come due, and then publish them. A side-effect of this is that in most cases an entry scheduled for 10:30 won't actually publish until 10:46 or 11:15, or even later (depending on your MT configuration and other periodic tasks). But what if the post is time-sensitive, and you really want that post to live at 10:30? This plugin aims to address this by creating a "TheSchwartz" job to publish the post. When the entry is saved, a job gets created for the entry, configured to run at desired publishing date and time. Combine this with running the run-periodic-tasks in daemon mode and scheduled posts should publish very close to the scheduled time. This works in both FireFox and Chrome. Currently, the Buzz results are restricted to actual Buzz updates -- it excludes updates that are imported from other services sich as Twitter, Google Reader, RSS feeds, etc. This seemed to provide the best experience, but a future version may have options/settings for adjusting this. Buzz results are presented in plain text, limited to the first 140 characters, so they don't take up too much screen space on the Google results page. A "more »" link appears when the Buzz has additional text or media (links, images, etc.). The Buzz results are powered by the Buzzzy API. A big thanks to the creators of Buzzzy for there work in creating a search engine and API for Buzz updates! Click the "Install" button on the "Buzz Search Results on Google" page on userscripts.org. Install the Google Chrome Extension from the Extensions Gallery: Buzz Results on Google Chrome Extension.